Click here to go back to the Chatzi Kaddish. Click here to go forward to Yotzeir Or. The Bar'chu is recited while standing. 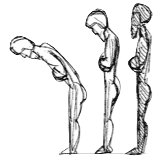 Traditionally, the prayer leader bows on the word "Bar'chu," and the entire congregation bows on the word "Baruch." The Bar'chu is recited by the prayer leader to call the congregation to prayer. It is the beginning of the formal communal worship service. The Bar'chu is recited in a "call and response" format. The prayer leader commands the congregation, "Bless Adonai who is blessed!" and the congregation responds, "Blessed is Adonai who is blessed forever and ever!" The words do seem a bit odd. Why should we bless God if – as the words of the prayer say – God is already blessed now and forever? The answer may be that we do not bless God in order to change God. God is already the source of all blessings, whether we acknowledge it or not. It is not in our power to change God in any way. Rather, we bless God because in order to change ourselves. When we state, "Blessed is Adonai," we recognize that we are blessed by God. By acknowledging God's gifts to us – the world we live in, minds that can understand, hearts that can feel compassion, and our very lives – we become more understanding and more compassionate human beings who live with a sense of gratitude and obligation to God.